Easy Pear Tart is an easy, delicious and impressive dessert that is perfect for family dinners or a holiday dessert. Juicy sliced pears are fanned onto flaky pastry, baked until golden brown, then brushed with pear preserves for a delicious glossy sheen. Free-form fruit tarts and galettes are quick and delicious use of seasonal fruit and because there’s fruit you can feel less guilty about eating dessert. This is a versatile dessert because I like to use same recipe and change it up between pear and apple. Today, it’s pear. I’m also partial to a savory tart/galette. If you are too, you need to try Herbed Tomato Galette with Parmesan Crust. If you want a sweet option, I have a Rustic Blood Orange Galette that is not only delicious, but pretty for the eyes. This a dessert that is light and not too heavy. Perfect after a big meal with a scoop of French vanilla ice cream and we all know the biggest meal of the year is Thanksgiving so why not serve this?, The tart serves 12 so if you’re cooking for a crowd, this is the dessert for you. You can change this tart with the seasons. Peaches are a delicious option, figs, strawberries, all berries in fact. If you’ve tried this Easy Pear Tart or any other recipe on the blog then don’t forget to rate the recipe and let me know how you got on in the comments below. I love to hear from my readers! You can also FOLLOW ME on FACEBOOK, TWITTER, INSTAGRAM and PINTEREST to see daily recipe updates. Juicy sliced pears are fanned onto flaky pastry, baked until golden brown, then brushed with pear preserves for a delicious glossy sheen. To a food processor add the flour, salt, sugar and butter. Pulse until butter is combined. With the processor running, drizzle in the cold water until it start so clump and come together. Transfer the dough to a floured surface and shape into a flattened ball. Cover with plastic wrap and refrigerate for 15 minutes. On a floured surface, roll the dough to a 11 x 15 rectangle. Roll the pastry over the rolling in and transfer to the baking sheet. Refrigerate. Slice the pears lengthwise in 1/4 inch slices. Arrange the pear slices on the pastry, brush pastry edges and pears with melted butter and sprinkle evenly with the sugar. Bake for 30 minutes until the pastry is golden then remove from the oven. Heat the preserves in a microwave-safe dish for 20 seconds then brush all over the tart. I am a diabetic, can I substitute Splenda for the sugar? Hi Lisa, yes, I think this would work out fine. Thanks for stopping by. 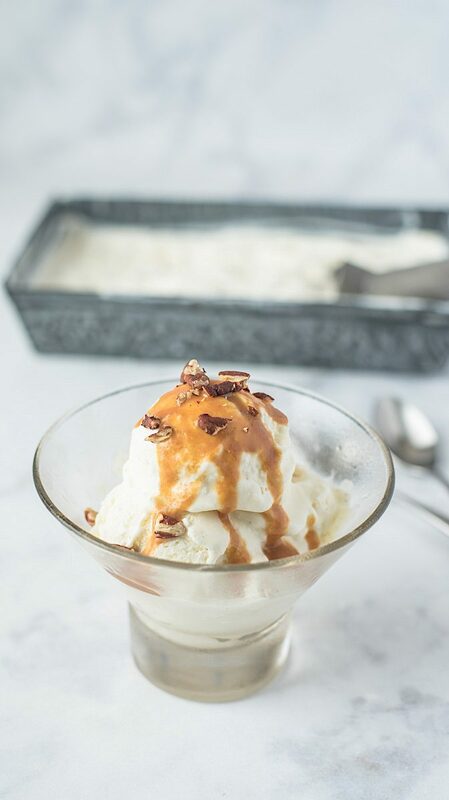 I love when something looks super fancy and decadent but in reality it is so easy to make. Thanks for sharing this one! Gorgeously simple, Janette. I recently ‘discovered’ making pastry in a food processor and you’re right, it’s so easy! This would be a lovely quick dessert to serve to guests, and I can think of so many variations. Love pears! Looks gorgeous! Pinned! Hooray for pear season! Pears are my all-time favorite fruit – I seriously can’t get enough of them! 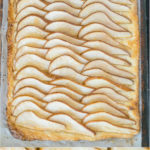 So when I saw this pear tart I had to wipe the drool off of my computer. This looks truly phenomenal, Janette! Oooh, this does look easy! And so delicious! Move over pumpkin pie ~ this is absolutely stunning, Janette! This is how I like my dessert– gorgeous and easy. Love this– I’ll have to pick up some puff pastry next time I’m at the store! This really is my kind of dessert – a little pastry and fruit – not a lot of sugar! Well done! Such a beautiful dish, yet so simple to make! Utterly perfect! This is one of my favorite fall desserts. I have a pear tart recipe that uses honey and rosemary and it is a fan and family favorite. Perfect way to celebrate the changing of the seasons. Beautifully executed! I love peach and apricot added. All favorites of mine. Thanks!